Life changes! Are you keeping up with these changes? Are you following dreams or goals? 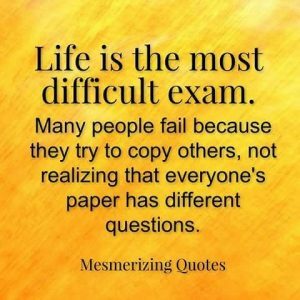 Do you recognize who you are? Are you ignoring who you are? Yep, pretty deep thoughts recently. It stems from the big changes in my life. The main changes include the opening of a dedicated martial arts school (having a three year lease on a space is scary) and the change in day jobs (which I avoid talking about as it isn’t about teaching martial arts). Well, it has taken quite a while but I think I’m finally moving toward the real goals I’ve had. The ones that were hidden underneath the desire to train and teach. This movement has brought up the questions that I led with. Back on Thanksgiving, I watched Hacksaw Ridge. This is an outstanding movie that everyone who knows me would appreciate as well. One theme in the movie that struck home, because I guess I was ready to hear it, was about being true to yourself. Your values and holding true to them are what make you the best you possible. A bit of selling out can diminish yourself (loss of self respect) and put you into situations that don’t help you grow into who you are supposed to be. This connects to some of the material I’ve been reviewing recently. I had been introduced to Joseph Campbell’s Hero With A Thousand Faces a long time ago but have recently come across it again. 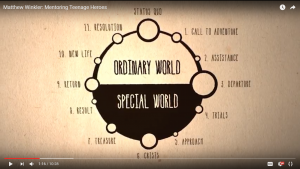 The Hero Round Table has taken Campbell’s “Hero’s Journey” and is working at using it to help people break through their fear to find the Hero that they can be. Having the Hero myth in the back of my mind, I watch movies differently. I watch the steps unfold as the Hero’s Journey takes place. Now it is time for me to take my new Hero Journey! Something that has needed to happen, and finally has, was recognizing and accepting what/who I’m not. For a long time, I’ve been doing work to make sure there is some stability in life. This was done by making safe choices. Which is quite a contradiction to much of what I teach. I wasn’t developing courage or moving forward toward goals. I have such awesome students, not from anything that I’ve done, but from how they are all working toward their goals and dreams. They’ve taken the opportunity to create another family (through training together) to gain support from. I haven’t been practicing much of what I’ve been preaching. That changes now!